I have a weird problem with my v1.4 LimeSDR. I see DVB-T and DAB signals all over on 2m band (100-200 MHz). The picture shows the original signal on 725 MHz at the bottom and the mirrored image on 145 MHz. Around 187 Mhz I even have GSM signals from ~950 MHz. The original signals are very strong - is there any way to apply filter settings to eliminate this mirroring? The problem appears at any bandwidth, sample rate and RX input. I dont see 187Mhz in this picture … what was the Lo set at? I am just wondering, why this happens? 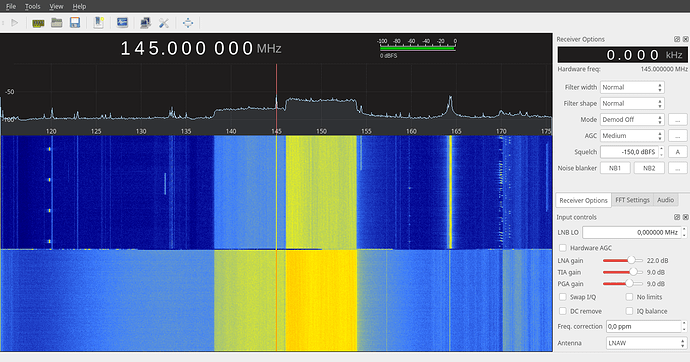 I have a HackRF too, which doesn’t have this problem at all. Put your hackRf in bypass mode … it has filters. Do you also see signals that strong imaging somewhere? Anyway, i’ve written an email to limemicro concerning this problem. yep, i got the point with the harmonics, but i would rather want to see the signals, where they should be. It also just has 8-bit ADC & DAC. RX performance is similar to RTL-SDR dongles. What are you using for an antenna anyways ? I disassembled it once - it is basically a copper wire with traps. I even use a pre-selector in an Atlas350XL to limit the Rx to around 30Khz around the specific HF frequency i want to listen to.